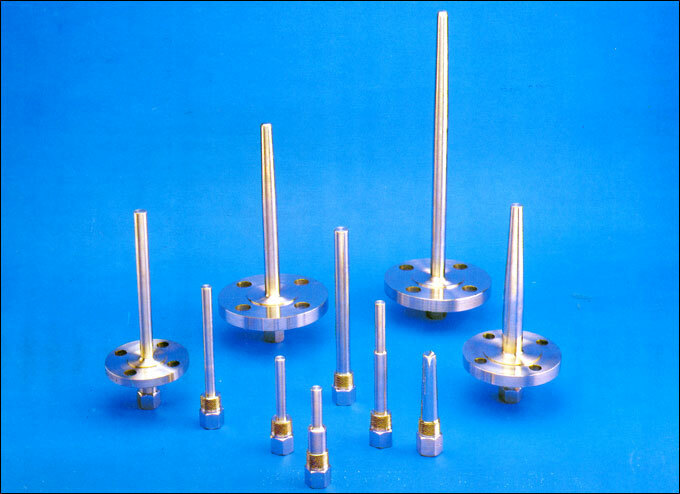 'MASS' make thermowells are design to protect the temperature gauges from various corrosive media, Pressure, Viscous material or Velocity and abrasive's. A thermowell design permits quick removal and easy fitment of thermometer for replacement, repair and testing. 'MASS' thermowell features welding neck or screwed connection from solid bar construction to fit standard stem length. 'MASS' can give thermowells in straight, tapered, stepped and standard flange construction. 'MASS' make thermowells are widely used for Bi-metal, Mercury, Gas filled thermometer, sensors and different application like Pulp and Paper industries, Food and Beverage industries, Machine and Apparatus construction, Chemicals, Petrochemicals, Fertilizers, Refineries, Pharmaceuticals and National Thermal Power Stations. Flanges Material S S 316 / 316L / Hastaloy C / Monel & other on request. Process Flange Size 1/2" , 1", 1 1/2", 2", 3" with standard 150# to 2500# reating flanges with RF, FF or any special serration as per client's requirement.